Hello, again! The work week sure does come around with consistent regularity, doesn’t it? But it sure helps knowing a week from now I will be on VACATION! Ahem, sorry. A full eleven days away from work…woah. I don’t know if I can handle it…wait, yes I can. Enough daydreaming, there’s still lots to do between now and then. While I’m looking forward to some R&R (obviously), this past weekend was a good glimpse into what I’m envisioning my vacation to be like. In just two days (just think what I could do with eleven!) I enjoyed dinner with friends, a fire and s’mores while admiring the starry night with my main squeeze, a classic date night consisting of dinner (sushi) and a movie (Inside Out), and a chance to do some baking (a future post on that to come!). And if I could, I would probably re-watch Inside Out a couple more times during my vacation. Seriously, how does Pixar know so well how to pull at your heart strings? What I love more than laughing and tearing up during a movie is seeing my husband next to me doing the same thing. We both loved it! Like any great recipe, this one formed after having leftover ingredients in my fridge…leftover mint from my Freekeh & Grape Salad with Mint & Feta to be exact. If there’s one thing I can’t stand in the kitchen, it’s having to buy an ingredient for a recipe only to have more left over than what I actually needed for the recipe. In my attempt to not let this happen to you (or me), this recipe is a perfect way to use up that mint (I mean, mojitos would do a good job, too, but let’s say you have a lot of mint to use up…then this is the perfect recipe). This is a pizza you can feel good about serving your family. 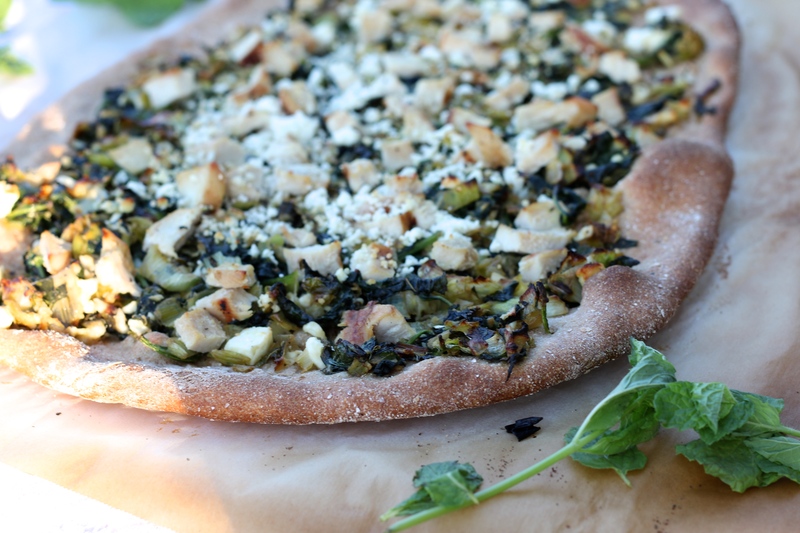 Whole-grain crust as the base is my ideal vehicle for delivering a serving of vegetables. The amount of spinach and leeks in this recipe may seem like a lot, but it all wilts and reduces down to just the right amount for covering the pizza. So, not only will you be doing your bacteria a favor, you’ll also be doing your taste buds a favor by making this pizza. 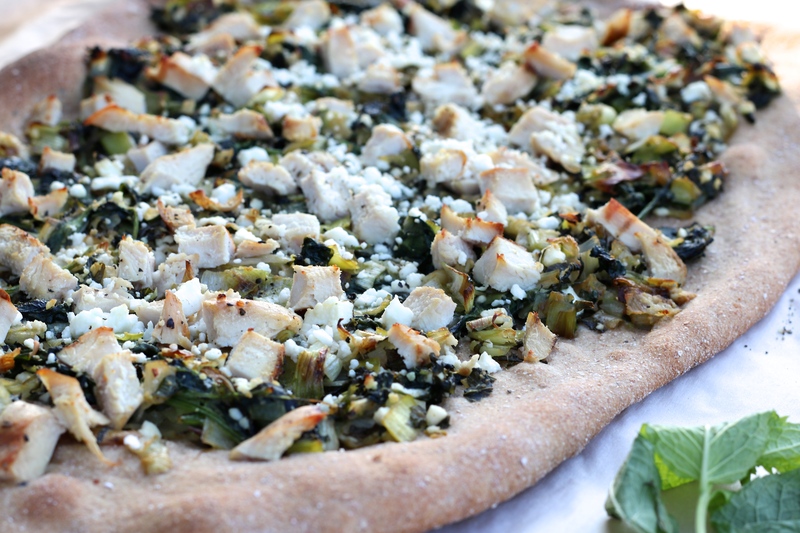 The mint and feta pop and the chicken gives this pizza some staying power. Nothing about this pizza is overpowering, but rather, everything ties together really well. 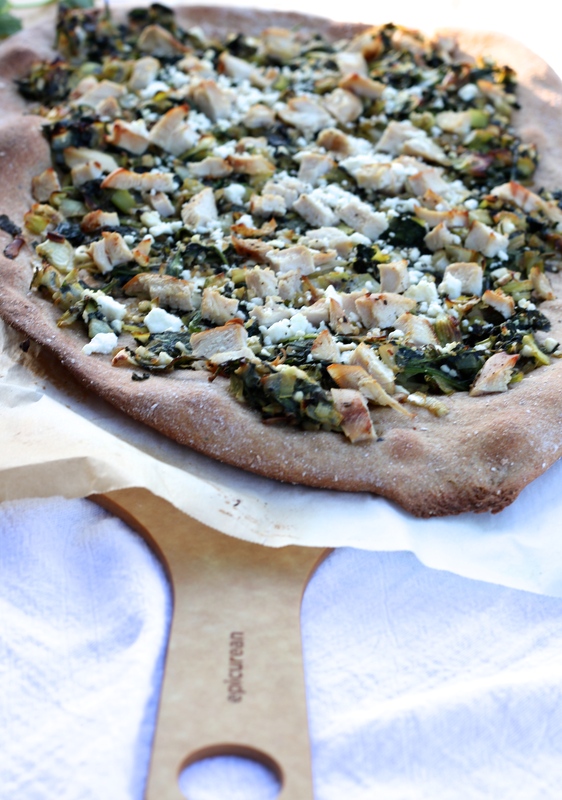 Whether you’re in the mood for a change to your typical pizza night or you made (and loved!) the Freekeh & Grape Salad and have leftover mint or feta, this pizza is just what you need to get you through the work week — even if a vacation is just around the corner. Preheat the oven to 475 degrees with pizza stone placed on an oven rack in the center of the oven. On a lightly floured work surface, roll out the dough into a 1/4-inch thick rectangle. Transfer dough to a sheet of parchment paper and place on top of a pizza peel or on the bottom of a baking sheet to help slide the pizza onto the stone when ready. (If you don’t have a pizza stone, place pizza on a baking sheet). For the topping: In a large skillet, heat the oil over medium-high heat. Add the leeks and season with salt and pepper. Cook, stirring frequently until tender, about 5 minutes. Add the garlic and cook for 30 seconds. In batches, add the spinach and cook until wilted, about 5 minutes. 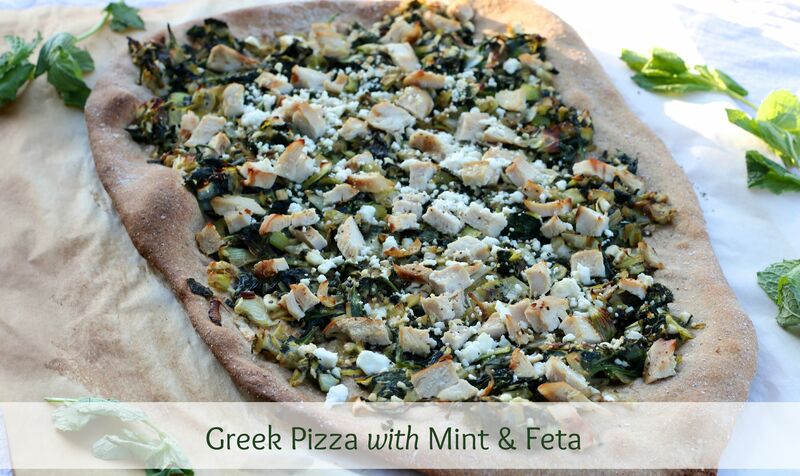 Remove the pan from the heat and add the mint and 3/4 of the feta cheese. Season with pepper, to taste. Spread the spinach mixture on top. 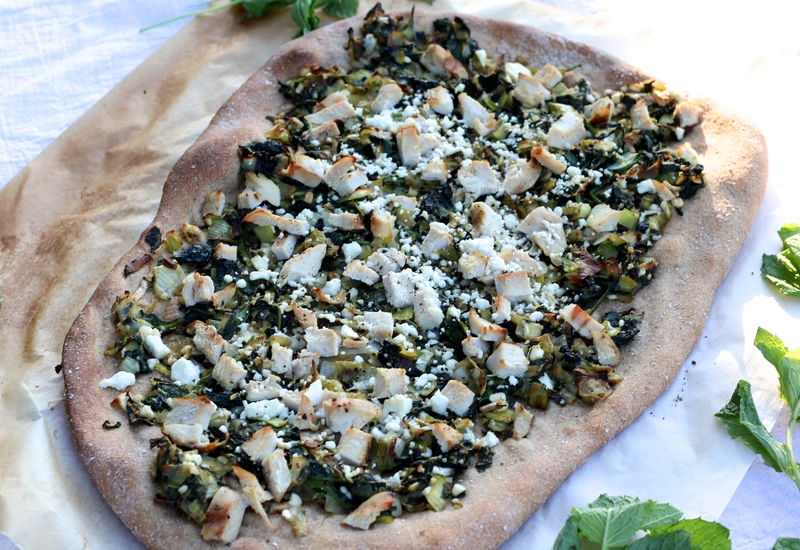 Top with chicken and additional feta cheese. Turn oven down to 450 degrees and slide parchment paper onto the heated pizza stone (or simply place your baking sheet in the oven). Bake until the dough is golden and crunchy, about 15 minutes.